PreviousMNL! MNL! He Keeps Coming Back to MNL! NextMalaysia Readies for its Own Full-Concert! We should probably prepare one for Malaysia, Indonesia & Manila, now that you’ve posted Vietnam! JR -- Good idea about creating these for each Asian appearance/concert. I think we could repost them for the week of each concert, too, just to keep them up front. I Love the styling of this poster! Jr Mostly lurk here but want you to know how much I appreciate all the work you and Marlie do to document David’s journey. Has there been anything on the Asia radio interview he did ? Does anyone remember the concert where David sang a Spanish song by Selena with the bachata group. one of the fans did a drawing of David from a picture taken there. The concert was in Texas last year. So happy David is enjoying Nashville!!! “…After the weekend my internship started and you would never guess who decided to pop into my lobby during my first week. DAVID freakin ARCHULETA. REALLY? excuse me, let me calm down. really? its my first week here and I’m already running into a celebrity? Although I didn’t get to meet him, it was all the gossip that the interns of EMI CMG Publishing needed to start their week off right in nasville, TN. Yes Marlie! Couldn’t remember the name of the show or the name of the song but remembered the outfit and general info. I included footage of Decemberists and Florence + the Machine. A rare instance that TMZ cannot, did not cos they could not diss David! Yahoo! Fans of David Archuleta can dance around for joy because the Elevator singer and American Idol cutie will be heading our way. And here’s even bigger news -- David won’t just be in town for a small promotional visit but is scheduled to play a full on concert here. DAVID ARCHULETA LIVE IN KUALA LUMPUR, 26TH JULY 2011! KUALA LUMPUR, 13 JUNE 2011 – The numerous requests from fans on Sony Music Malaysia’s Facebook page to bring David Archuleta back to Malaysia have finally been answered! He will be back in Kuala Lumpur for a full concert, organized by Sony Music Entertainment Malaysia, on Tuesday, 26th of July 2011, 8pm at Stadium Negara! Ticket pricing is at RM300 for VIP, RM230 and RM190 for numbered seating, and RM150 and RM90 for free seating (All prices shown excludes RM3 ticket handling fees). The concert ticket will go on sale 20th of June onwards. Tickets are made available through Ticket Charge (www.ticketcharge.com.my) and AirAsia RedTix outlets (www.AirAsiaRedTix.com). The Managing Director of Sony Music Entertainment Malaysia, Adrian Lim mentioned that, “This will be David’s first ever concert in Malaysia and is also the first time that Sony Music as the music label is doubling up as the organizer for the concert… being in both of these roles gives us more flexibility in giving the fans more accessibility to him. We will have more activities than just a normal concert”. The 20-year old Utah native’s self-titled 2008 debut album contained hit songs like “Crush”, “A Little Too Not Over You”, and “Touch My Hand”, were on the Top 10 charts across all major radio stations. His follow-up album, “The Other Side of Down” which was released last October, also generated hit singles like “Something Bout Love” and “Elevator”. Both singles were also on our local Top 10 radio charts. David is undeniably successful in Malaysia, with a combined album sales of 19,000 units sold, reaching the Platinum status. David’s last visit here in April 2009 had an overwhelming response, as there were more than 5,000 fans who showed up for his showcase in Sunway. His exceptional vocal talent and charismatic boy-next-door charm has captured the hearts of many Malaysian fans, regardless of their age group. Stay tuned for more updates on the Ticket Launching event happening this Sunday, 19th June from 3-6pm at Berjaya Times Square. More details will be announced soon, so make sure you log on to http://www.facebook.com/sonymusicmy for the latest updates! Jr, Had to laugh @ that Jimmy Kimmel comparison. I happened to be watching Kimmel right before the game when he said this and I got pretty excited. Nice to be remembered!! Lots of excitement for the Asia fans. Bet you are getting pretty excited about David’s tour in your homeland. So excited we’ll be seeing all the excitement as you gals document it!! MARLIE -- do I detect a sigh after that statement? Don’t worry, David will tour in the US after Asia. BTW, I already created pages for all the Asian countries that David will visit this July. We just need one for Stadium of Fire. I will have that ready shortly before the event. The “IDOL Music Event 2011″ will be the pinnacle high-wattage media event to usher in the new decade–converging international star power, television cross-promotion, music and live entertainment to reach the widest possible audience in Vietnam, across Asia and beyond. 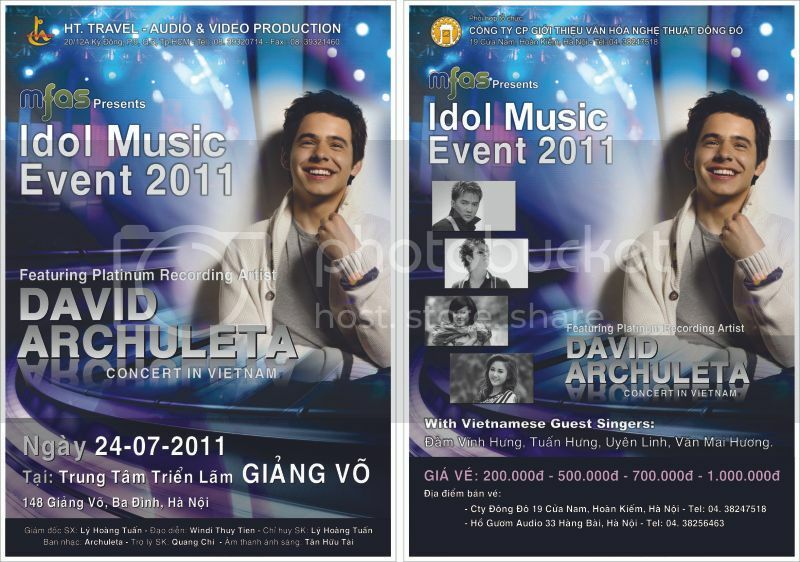 The IDOL Music Event 2011 staged in Vietnam July 21 -25 will feature global music sensation David Archuleta, along with other celebrated Vietnamese pop stars. Half the profits from this event will be donated directly to charities such as Franciscan and Vong Tay Nhan Ai. David Archuleta has been a growing international music sensation since his runner-up performance in the seventh season of American Idol in 2008. Now with the release of his highly anticipated second album, “The Other Side of Down”, capturing two years’ worth of personal introspection and reflection, dozens of songwriting sessions, long days spent in the studio and nights in the air, David’s national presence is about to take a giant leap forward. And there’s the insatiably curious David, who doesn’t have all the answers but is resolved to keep searching for them. Look no further than his sugar sweet single “Something ‘Bout Love” for the sound of reach-for-the-sky bliss, and the hard-driving big chorus of “Complain,” which, despite its title, is an encouraging song beckoning the listener not to take anything for granted. Don’t miss the many sides of David at IDOL MUSIC 2011! Love that Bio of David,JR. So nice to see the respect of David. Yea!! It would appear that David found some time to collaborate with One Voice Children’s Choir, former 2002 Winter Olympic Children’s Choir. They continue to share their light within through inspirational music composed and arranged by their director Masa Fukuda. The choir consists of 120 children from Salt Lake and Utah Valley. Okay, so I’m not a big fan of that song David is singing with the children’s choir, but I’m a HUGE fan of that Voice. It doesn’t matter what he sings, I love hearing it -- and his voice is particularly beautiful on that recording. We all know that David wrote Falling. But according to SomethingBoutArchie, he also wrote Best of Me & You Alone and all three were intended for the TOSOD album. Yes, this is David Archuleta. Yes, that’s me beside him. And yes, if it looks to you like he’s holding my hand, go on believing it. Notice that he’s only a couple inches taller than me, making me the perfect size for him and making us the perfect couple. He is the love of my life. But seriously. I “ran into” him last night at the Nashville Sounds Mormon Night. Not sure why a minor league baseball team hosted a Mormon night, but it was really cool. The missionaries sang the National Anthem. Anyways, Jeff and his friends were roaming all over the stadium, jeering at the opponents and annoying fans with their yelling. They stumbled upon none other than David Archuleta and his parents and girlfriend (we think). So they sat behind the family and cheered really loudly. The Archuletas turned around, said those seats were taken, and asked them to leave. Jeff and Co. came to our section again, mentioned that David Archuleta was there, and several of us girls joined them. We scoured the stadium because David had gotten up for drinks or something and was gone from his seats. We followed his mother. We placed ourselves directly at the entrance to his section. And we waited. Finally! He appeared. He was talking to a group of people. We kind of cut in and asked for pictures, and he seemed a little peeved that people had noticed him and were making a big deal out of it, but HEY! We’re his fans and he’s gotta be nice to us and there was NO way I was leaving without meeting him. So he took the picture with us! I was way way way nervous and I have to admit I was kind of trembling a little because I have never before been in the presence of a demigod (just kidding! about the demigod part, not the trembling part, that bit is true). He was nice, very quiet, very short, just really subdued. I also got a picture with Ozzie, the mascot, but I don’t care that much about him and I’m too lazy to put the picture up. Omg!!! I seen David Archuleta today at paramount!!!! HA NOI – The first runner-up in American Idol 2008, David Archuleta, will be performing for the first time in Viet Nam at the Idol Music Event next month. The 21-year-old pop singer and songwriter was among the youngest contestants in the 7th season of American Idol in 2008. In the final he won 44 per cent of the 97 million votes cast by the public. In the same year he released his debut album Crush, which reached No 2 on the Billboard 200 chart. The album has now sold more than 750,000 copies in the US and 900,000 worldwide. Archuleta will be performing at HCM City’s Military Zone 7 Stadium on July 22 and at the Giang Vo Exhibition Centre in Ha Noi on July 24. He is scheduled to sing between 10-12 songs, including the ones depicted in his 2010 album The Other Side of Down, which ranked 13th in the Billboard Top 200. Several popular Vietnamese singers, including Ho Ngoc Ha, Ho Quynh Huong, Dam Vinh Hung and first runner-up in Viet Nam Idol 2010 Van Mai Huong, will share the stage with Archuleta. About 12,000 tickets for the performance in HCM City and 4,500 for the show in Ha Noi will be available at the end of this month. The ticket price in HCM City will range from VND100,000 to VND1 million. Tickets in Ha Noi will cost from VND200,000 to VND1 million.